Yogini Shambhavi Devi provides astrological readings (consultations) from her background of working with the Goddess energies and deeper yogic teachings. She facilitates one to draw the Shakti (power) of the planets as a movement of grace into ones life. Through her advice she creates an awareness of the 'Planetary Influences' in our lives, guiding one to work through the karmic strains with restorative and harmonizing Upayas or Vedic remedial measures. 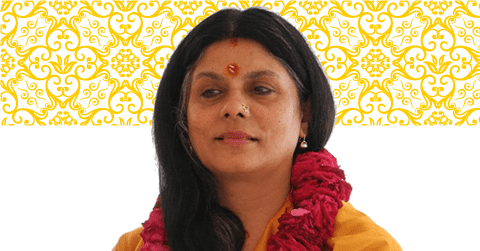 Yogini Shambhavi Devi has guided sadhaks on the spiritual path, especially women looking to discover the Shakti or Goddess power within themselves. She accesses the wisdom of Vedic astrology to help us deal with aour issues on all levels of life, particularly in regard to our yogic path, ultimate life purpose, dharma and fulfillment. Shambhavi has taught programs Yoga and Vedic groups worldwide. These include Sivananda, Kripalu, Yogaville, National Ayurvedic Medical Association (NAMA), Association of Ayurvedic Professionals of North America (AAPNA), California College of Ayurveda (CCA), Council of Vedic Astrology (CVA), American College of Vedic Astrology (ACVA), and Sudha Dharma Mandala Brazil. She is one of the primary teachers for the advanced Mantra Meditation teacher training at the Chopra Center. She has spoken before various Hindu temples, ashrams and associations in India and in the West. She has been honored by many great gurus including Sadguru Sivananda Murty, Swami Veda Bharati, Swami Dayananda Sarasvati, K. Natesan, and Swami Mitrananda. She has spoken before BHU (Benaras Hindu University), Sanchi University and Nalanda University in India. Yogini Shambhavi has been honored with the Jyotish Visharada from the Council of Vedic Astrology (CVA) . She gave the opening chant for the UAC conference in New Orleans in May of 2012. She has received special training from Vamadeva in astrology over the past ten years, including an award of proficiency in Ayurvedic or healing Astrology, Ayurveda Astrology Praveen. She is our resident Jyotishacharya or Jyotish teacher for the institute. Yogini Shambhavi’s consultations cover spiritual practices, emotional well-being, relationship concerns and life-guidance. Remedial measures of mantras, rituals, meditation and propitiation of deities may be offered according to the deeper teachings of Tantra, Ayurveda and Vedic Astrology, with emphasis on how to access the healing power of Shakti or the Mother Goddess. Her Jyotir Bhava mantra CD, teaching the main mantras for the planets and their deities, is highly regarded. Shambhavi is one of the few astrologers who understands the secrets of astrological mantras and how to use them to optimize our karma. Shambhavi discusses the client’s Vedic astrology chart according to the client’s specific questions and concerns. Shambhavi’s “Yogini Astrology,” is unique in its depth, insight and manner of expression. She has the ability to help us understand our karmas and offers yogic insights as to how to transform them. She helps us empower our deeper spiritual aspiration through understanding the planetary influences behind our lives and their deepest levels of meaning. Her mantra Shakti can help guide the client and provide insights into sadhana and life-guidance overall. Shambhavi offers life-readings, which includes an hour and a half session, addressing any special questions the client may wish to examine in the chart. Follow up readings are available, including an examination of the annual chart, dashas and transits. For her astrological consultations there is usually a waiting list, so you may need to book more than a month in advance. Shambhavi only does a limited number of readings. She gives preference sadhaks and those seeking spiritual guidance. Please contact Shambhavi (Shambhavi.yogini@gmail.com) for setting up a consultation, ask for a “Vedic astrology consultation information form,” fill out and email back. Shambhavi also offers consultations for spiritual guidance – for which an analysis of the birth chart is not required. In addition, she provides special Mantra Initiation and Shakti Sadhana for a more direct level of working with her. Please ask her about these options if you are interested. Shambhavi has been recognized as a Guru or spiritual guide by Sri Sadguru Sivananda Murty. She has been honored as Yogini Shambhavi Devi, by Yogi Amrit Desai and his Amrit Yoga institute. Yogini Shambhavi is part of the ancient Hindu Shakti yogic spiritual tradition, which is Devi Shakti Tantra. With the grace and blessings of many revered Gurus, she has been teaching and focusing on spirituality in daily life. She was born in Gauhati, Assam, the most important sacred site of the Goddess. She has spent extensive timee in Himalayan temples and their rituals and carries their Parvati energy.